Hi there y'all! Actually this is my first post, so i'll just say i'm glad to have joined your community. My latest project has to do with what i call the A2000 GRT UX (Greek Tower Unix):hammer: Although i have started it a couple of months ago, there's other projects taking place simultaneously, so it's in slow pace :-) Some of you might know my work from other forums, like the A600 GRL (Greek Laptop), but this is targeted towards the Unix enviroment.. To get to the point, the setup includes an A2000 rev.6 mobo, an A2630 accelerator, an A2090 SCSI controller with an accompanying Combitec autoboot module (Zorro), a Domino graphics card, an 8up memory card, 8MB RAM (4 on the 030 board and 4 on the 8up), an IBM 4GB SCSI hd, a Quantum 540MB SCSI hd, a Toshiba SCSI CDROM, and an HP SCSI DDS tape drive. That's for the time being though.. I plan on plugging also an Oktagon 2008 card, and a PGA370 PC board (Celeron 1.3Ghz), space permitting! This whole thing is assembled in a full-size tower, which is already crowded! Pics of the project can be seen at http://www.amigahellas.gr/modules/newbb/viewtopic.php?viewmode=flat&type=&topic_id=2470&forum=9 That's the Amigahellas forum of the Greek Amigans. So, i have reached a point where i believe the most essential parts of the assembly are in place, and have fired 'er up yesterday just for a fast test. The boot menu when pressing both mouse buttons brings up a screen like this What i don't know is wether this is a menu produced entirely from the accelerator or from the SCSI controller. 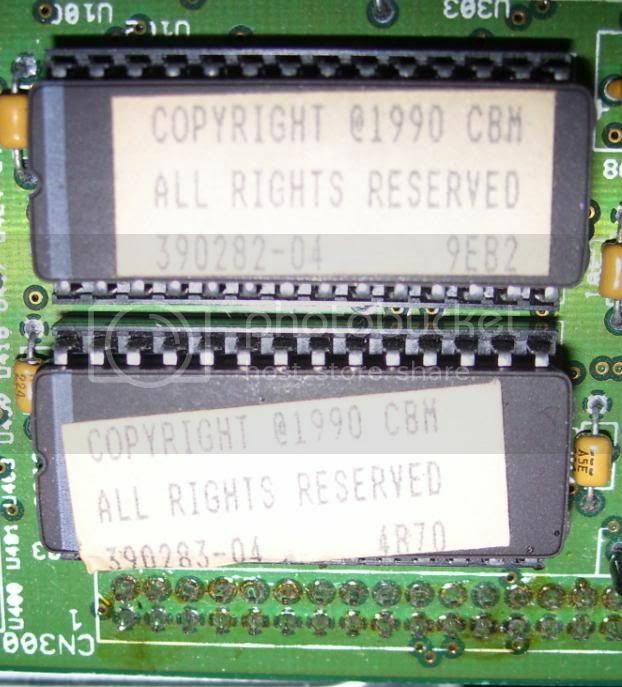 I have seen screenshots of the A2630 board menu, which has only the first 2 selections (68000 or 68030) but not the AMIX option. I haven't done any formatting on the hd's yet, and there's no OS present (either AmigaOS or AMIX) Has anyone attempted to setup AMIX on an A2000 before? I'd appreciate any experiences! what are the rom on your A2630 accelerator ? All you need is CBM68030, 2091 and lots of RAM that Amix can use. Graphics card is nice add too, but speed is what is a bit desired. These ROMs look like version 6. I don't think they are 7?? 7.0 might be required. 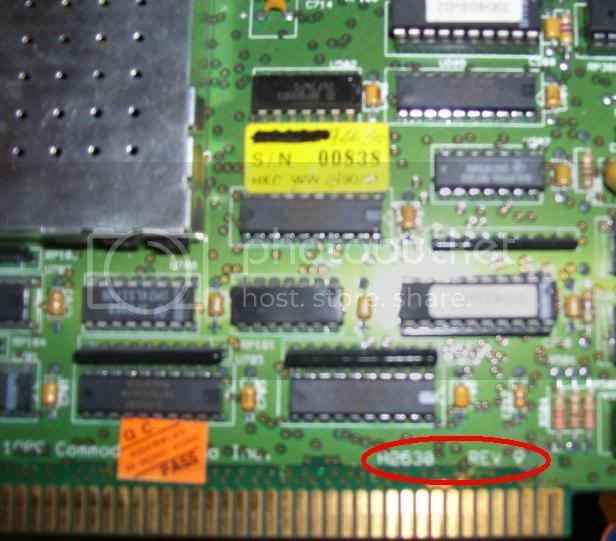 Allright, it appears that -04 on the ROM chips indicates they're version 4 (duh!) according to what i read at softwarehut's upgrade instructions pages. But as it seems, upgrading the ROM versions has to do with being able to use Kickstarts higher than 1.3 If that's the case, it's not what i'm after. I don't need to worry about KS or Wb versions, since i intend to use this machine solely for AMIX. Yep, thats version 4 allright. If you need version 7 contact amigaATnishtekDOTcom. Oh thats up to you, if you can get rom 1.3 & 2630 rom 4 to work thats great. Workbench and kickrom 1.3 is so ancient though. By the way, you can upgrade roms to version 7 on 2630 and still continue to use kickrom 1.3. However, having said that, I have a working Amix but on rom 3.1 & rom 7.0 on both 2091 and 2630 board. You also got a pm about that. Actually the option AMIX will disappear in the later version of the ROM's. You're hardware is not supported, at least not out of the box, but you could at least try. Get the gateway unix driver CD if you intend to use any but original C= hardware. Your A2090 might work, but I've only had experience with installing on an A2091. The 8Up! board is unknown. Thanks for the advice folks! As i was saying, Kickstart versions ain't what i'm after, since i don't intend to use the Workbench at all on this one.. I have been visiting the amigaunix site for quite some time, and it does have some very useful info gathered, but it hasn't got the "flexible" forum-type conversation thingy i need. Talking directly with people who had a hands-on experience is very important! Yeah, Amiga.org is THE place for advice. Lots of information gets posted quickly. Join the Google Amiga Map!! That's exactly why there's no forum on amigaunix.com :-) I used to have one there long ago, but there were no posts besides me talking to myself. There's just not enough people/interest. And, frankly, I have no desire to compete - as it were - with existing Amiga outlets. Most everyone here is extremely helpful, and happily nobody seems to be bothered by my one track mind. Looks like I do need to update the discussion link to point to this forum, though, now that there's a specific place for Amix discussion. Thanks Wayne and a.org! Yeah, but you can still boot OS 3.1/3.9 and Amix based on boot priority. If I install 2091 7.0 rom (http://cgi.ebay.co.uk/ws/eBayISAPI.dll?ViewItem&ssPageName=STRK:MEWAX:IT&item=260439320935) on a 2090A SCSI card will this make it autobootable from the SCSI? No. It'll just make it not work.